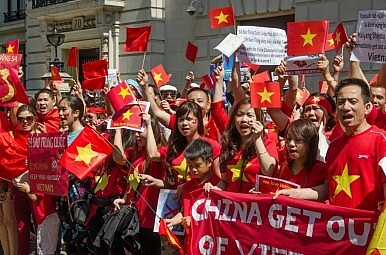 With few effective means to respond to provocations, Vietnam encourages a public spirit of patriotic defiance, to a point. The present skirmish over a Chinese oil rig in the South China Sea is creating a political dilemma for Hanoi’s leaders. As the government of Vietnam struggles to cope with very real threats from China, without provoking a war that it cannot win, it also seeks to maintain legitimacy in the eyes of an increasingly worried and restive population. The government has attempted to mobilize public opinion to support Vietnam’s claims in the South China Sea and to foster a spirit of patriotic resistance, but at the same time it acts heavy-handedly in order to constrain anti-Chinese exuberance. Many Vietnamese newspapers, both in print and on the web, are filled daily with articles about the oil rig and the confrontations between Chinese and Vietnamese vessels. Vietnamese television channels, all government owned, run hours of documentaries showing the importance of the islands, historical claims to sovereignty, and military preparations to defend them; along with dozens of patriotic music videos (“Spratly Islands Always in Our Hearts”). There are occasional rallies that are carefully orchestrated, featuring government and party officials, plenty of youth, and signs in English and Vietnamese (“China Out of Vietnam’s Islands”), but curiously, few are in Chinese. Last week, the government of Vietnam released a brief video of a Chinese ship ramming and sinking a much smaller Vietnamese fishing boat in the South China Sea. The Chinese vessel steadily approaches behind the Vietnamese boat, as it gradually becomes clear that the Chinese ship is not going to stop or turn. It overtakes the Vietnamese boat, looming over it and ramming into its stern, then seems to ride up onto the vessel. The Vietnamese boat begins to turn on its side. Screams are heard from observers on the boat from which the video is being recorded. The Vietnamese boat then flips and sinks. While the video has stirred Vietnamese anger, it also drives home two points, which China has been communicating to Vietnam for some time with growing emphasis. First, Vietnam does not have the means to obstruct Chinese encroachments in the South China Sea, which will not stop. Second, there are serious limits to any assistance Vietnam can expect from other countries, particularly the U.S., such that outside pressure is unlikely to resolve the conflict. In short, China’s message is that in the South China Sea it can do as it pleases, there is nothing Vietnam can do about it, and no one is coming to help. Confused Vietnamese citizens are getting the message. As one official of Vietnam’s foreign ministry said to me last week, “we’ve done everything we can do. What’s left to do?” In the long run, as is commonly observed, Vietnam needs to strengthen its alliances and military partnerships with other Southeast Asian nations, and with powers outside the region. That is a long–term strategy however, whereas China’s escalating pressure is immediate. Meanwhile, high school and university students have been systematically admonished by their teachers not to participate in “poorly organized” (i.e., unsanctioned) demonstrations. Following one such anti-China protest by factory workers near Ho Chi Minh City a few weeks ago, which devolved into a riot entailing some loss of life and extensive property damage, hundreds of rioters were arrested and prosecutions have begun. Since then, the government has put a very firm lid on demonstrations. Here in Hanoi, the last few weekend mornings (the normal time for demonstrations), have seen an extraordinary police presence in areas where demonstrations had been taking place. Near the Chinese Embassy, parks, cafes, and the War Museum were closed. Streets and sidewalks were blocked with portable iron fences. Truckloads of plain clothes security police conspicuously took up positions at street corners, sipping tea, watching and mingling with pedestrians. In a nearby parking lot normally used by tourist buses, a large, military-green armored vehicle surmounted by a water canon waited, yet without occasion to be used. The current oil rig confrontation has heightened the Vietnamese government’s long-standing dilemma, posed by its need to be seen by the public as resolutely resisting China, while keeping in check activity that might offend China, or bring unmanageable pressure on Vietnamese leaders. For years, bloggers have been arrested and prosecuted for complaining too vehemently about Chinese encroachments, not only in the South China Sea. Bloggers have been punished for complaining about the terms of a land-border settlement, and about a Chinese bauxite mining project in central Vietnam. In most of these cases, the blogger’s “mistake” was to have complained of insufficient resistance to China by the Vietnamese government. There is a widespread suspicion amongst the Vietnamese public that the government’s inner circles and the ruling Communist Party are overly deferential “little brothers” of China’s Communist Party. The Vietnamese government’s heavy-handed efforts to constrain anti-Chinese demonstrations and expressions of opinion simply confirm those suspicions in the eyes of many citizens here. William G. Frasure is Professor of Government at Connecticut College. He has worked and lived intermittently in Hanoi since 1997, teaching, lecturing, directing academic exchanges, and occasionally consulting for various Vietnamese government agencies and ministries.